Bonus: 20% Bonus in Pre ICO and ICO. Cryptonia Poker is bringing together the best of Poker with that of cryptocurrency. Powered with blockchain technology, this platform has the potential to deliver to a large consumer base with ease and transparency. We retain a small administration fee as rakes when our users purchase Cryptonia tokens. This is done to cover our admin and operational costs, much like traditional poker rooms. The cryptocurrency used in our poker rooms is also listed on exchanges, and will grow in value with the strengthening of the platform and its ecosystem, which means that we will grow only when our customers believe in us and extract value from the poker rooms. Our aim is to maximise our gamers’ returns. Out of the total tokens available in the system, ten per cent are reserved for encouraging more players to play and for maintaining liquidity in poker rooms. This is done by attracting players through higher tournament guarantees, leaderboards and freerolls. This will also bring in new players, adding to the overall value of the currency and hence that of the currency held by the Players. Besides this, thirty five per cent of the rakes we collect every month will be distributed back to the players in the form of bonuses and improved tournament pools to improve liquidity. This will be done transparently and fairly to encourage recreational gamers. With the cumulative effect of larger pool of players and increased value of the currency, larger benefits will be available to gamers, which will attract more players, which will again raise the value of the currency. This will make it a self-feeding system. Once the ICO is completed, a tournament with attractive guarantees will be hosted on the platform to attract new players and to encourage all the players on the platform to initiate play, to start building value in poker rooms. 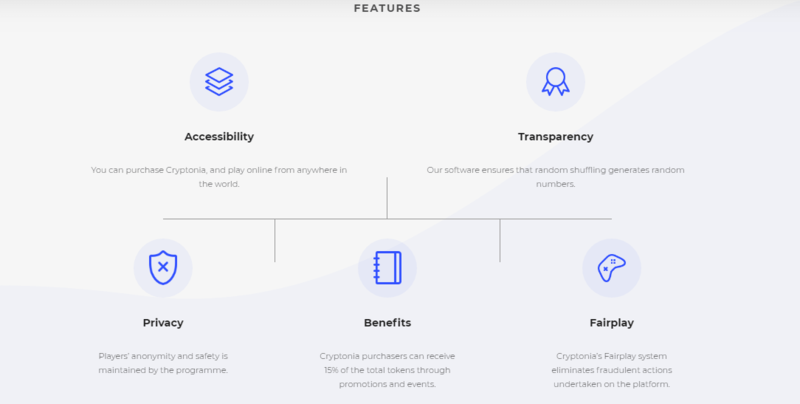 During the tournament, 10% of the Cryptonia tokens in the system will be distributed as tournament prize pools. These bonuses and attractive prizes will attract new players to join our poker rooms, adding to the value of the whole ecosystem. We will have various types of games with different limits for gamers with various preferences. They will be available 24/7 to suit gamers from various time zones. This is to encourage more and more recreational players to enter the ecosystem. Gamers can choose between various game formats including Texas Hold’em No Limit. 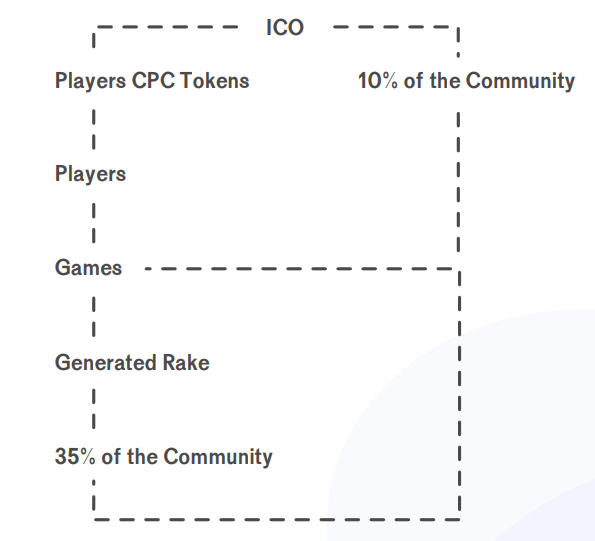 Higher limit games, e,g, $1000 equivalent CPC games, and games requiring higher liquidity will be available as the community gets stronger and the demand for such games rises. The opening tournaments on Cryptonia Poker will have a wide-buy-in range, i.e. from one dollar on to a hundred dollars. This will attract and encourage players to join the community. Our rake rate on cash games is only 3%, with ceilings set for different limit games. This will encourage gamers willing to play high-stake recreational games. Lower rake is more in favour of recreational players and less in favour of smart money that gets more rakeback. Also, smart money players often cash out the rakebacks, leading to reduced liquidity in the ecosystem.